Connect: For It or Against It? Connect is the new, happening thing on campus right now. 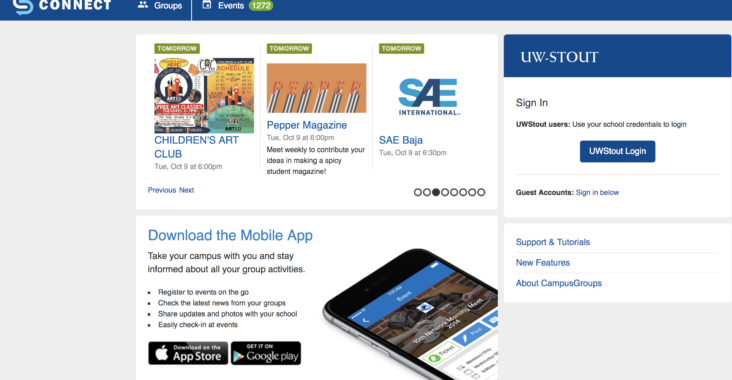 This is a new platform that students and faculty are using campus wide. Jennifer Lee, an Associate Director at the Memorial Student Center, gives us the scoop of why we’ve made our huge transition from OrgSync to Connect. Based on a response page that was put out, many of the University of Wisconsin Stout’s students are in the mix of liking or disliking Connect as a program. Out of 16 responses, 50% of these students said they do “like” it, 18.8% said they “dislike” it, and 31.3% said they “kind of like” it. Deon Canon, a current student and Stout Students Association (SSA) director of communications, is a frequent user of the platform. The transition from OrgSync to Connect is based on a contract. The contract the school had with OrgSync was over and it was time to find a new platform. “Connect is a very robust, user-friendly option that our students really enjoy,” said Lee. She continues to explain that Connect was a cheaper and overall accessible alternative compared to OrgSync. University of Wisconsin-Stout is currently under a three-year contract with Connect, and so far, it has been a positive beginning to the new software. Lee explained that her team members and members of SSA were a part of the demonstration process. They had three platforms, and everyone loved the way Connect operated. “I’ve heard nothing but positive reviews and feedback about Connect. I look forward to seeing how students use it this year,” concluded Lee.